The Northwest Indian War (1785–1795), also known as Little Turtle's War and by other names, was a war between the United States and a confederation of numerous Native tribes for control of the Northwest Territory. It followed centuries of conflict over this territory, first among Native American tribes, and then with the added shifting alliances among the tribes and the European powers: France, Great Britain, and their colonials. Under the Treaty of Paris (1783), which ended the American Revolutionary War, Great Britain ceded to the U.S. "control" of the Northwest Territory, which was occupied by numerous Native American tribes. Despite the treaty, the British kept forts and policies there that supported the Natives in the Northwest Territories. President George Washington directed the United States Army to halt the hostilities between the Natives and settlers and enforce U.S. sovereignty over the territory. The U.S. Army, consisting of mostly untrained recruits supported by equally untrained militiamen, suffered a series of major defeats, including the Harmar Campaign (1790) and St. Clair's Defeat (1791), which were resounding Native victories. About 1,000 soldiers and militiamen were killed and the United States forces suffered many more casualties than their opponents. After St. Clair's disaster, Washington ordered Revolutionary War hero General "Mad" Anthony Wayne to organize and train a proper fighting force. Wayne took command of the new Legion of the United States late in 1793. He led his men to a decisive victory at the Battle of Fallen Timbers in 1794. The defeated Native tribes were forced to cede extensive territory, including much of present-day Ohio, in the Treaty of Greenville in 1795. In 1608, French explorer Samuel Champlain sided with the Huron people living along the St. Lawrence River against the Haudenosaunee Confederacy ("Five Nations") living in what is now upper and western New York state. The result was a lasting enmity by the Haudenosaunee Confederacy towards the French, which caused them to side with the Dutch fur traders coming up the Hudson River in about 1626. The Dutch offered better prices than the French and traded firearms, hatchets and knives to the Iroquois in exchange for furs. With these more sophisticated weapons, the Five Nations nearly exterminated the Huron and all of other Native Americans living immediately to their west in the Ohio country in the Beaver Wars, beginning in the 1640s. The Native American nations were competing for hunting grounds for the fur trade. The western tribes had also been weakened by epidemics of European infectious diseases, against which they had no acquired immunity. The Five Nations's use of modern weapons caused the wars to become deadlier. Historians consider the Beaver Wars to have been one of the bloodiest conflicts in the history of North America. About 1664, the Five Nations became trading partners with the British, who conquered the New Netherlands (renamed New York) from the Dutch. The Five Nations enlarged their territory by right of conquest. The number of tribes paying tribute to them realigned the tribal map of eastern North America. Several large confederacies were destroyed or relocated, including the Huron, Neutral, Erie, Susquehannock and Shawnee. The Five Nations pushed several other eastern tribes to and even across the Mississippi River. The Ohio country was virtually emptied, as the defeated tribes fled west to escape the Five Nations warriors. After the Five Nations' warriors were defeated, they left much of the Northwest territory, Kentucky and Ohio almost unpopulated and with abandoned villages. They claimed the entire Ohio Valley as their own exclusive hunting ground. After about 1700, some remnants of the Native American tribes began returning to the Northwest Territory. They were often conglomerations of several tribes who paid tribute to the Five Nations (see also Mingo). Throughout the 17th and 18th centuries, both Britain and France claimed ownership of the Ohio Country, in competition with the Five Nations (who became the "Six Nations" after the admission of the Tuscarora in 1723), and by the mid-18th century had sent merchants and fur traders into the area to trade with local Natives. Violence quickly erupted. 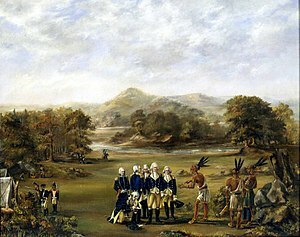 During the French and Indian War, an extension in North America of the Seven Years War in Europe, Native tribes allied with either the French or British, often depending on trading priorities, and warred with each other and the colonists. With its defeat, France relinquished all claims to Britain in the Treaty of Paris in 1763. The British still faced competition from numerous Native American tribes, including in the Great Lakes region: the Ottawa, Ojibwa, Pottawatomi, and Huron; in the eastern Illinois Country: the Miami, Wea, Kickapoo, Mascouten, and Piankashaw; and in the Ohio Country: the Delaware (Lenape), Shawnee, Mingo, and Wyandot. The tribes were angered by British colonials moving to settle in their territories. They attacked during Pontiac's Rebellion of 1763–66, when the Natives succeeded in burning several British forts. They killed and drove many settlers out of the Northwest Territory. Britain had to send troops to reinforce Fort Pitt and finally defeated the Natives in the Battle of Bushy Run. The war came to a close with nothing resolved. Britain officially closed the Northwest Territories to colonial settlement by the Proclamation of 1763, in an effort to create peace with the tribes west of the Appalachian Mountains. On June 22, 1774, the British Parliament passed the Quebec Act, which annexed the Northwest Territories to the province of Quebec. Some colonials, wanting to move to "new lands," described this as one of the Intolerable Acts that contributed to the American Revolution. The Chickamauga, a faction of the Cherokee led by Dragging Canoe, and the Shawnee were already at war with the "Long Knives" starting in 1776, in the Chickamauga Wars, which merged into the Northwest Indian Wars. During the American Revolution, four of the now Six Nations of the Iroquois League sided with the British. The Mohawk, Onondaga, Cayuga and Tuscarora fought against colonists in the Battle of Oriskany, aided the British in the Battle of Wyoming in Pennsylvania, and at Saratoga, the Cherry Valley, and raids throughout the Mohawk Valley in New York, as well as in numerous other actions on the frontiers of New York and Pennsylvania. As the British concentrated on the southern United States in 1779, General George Washington took action against the Six Nations. He instructed General John Sullivan to attack and destroy Six Nations villages in upper New York. Leading about 5,000 troops, Sullivan defeated the Six Nations forces in the Battle of Newtown, then destroyed over 40 Six Nations villages and all their stored crops in the fall of 1779. Because of the social disruption and crop losses, some Six Nations men, women, and children died of starvation that winter. Many Six Nations families retreated to Fort Niagara and other parts of Canada, where they spent a cold and hungry winter. Their power in the present-day United States territory was lessened, and their claim to the Northwest Territories was challenged. In 1778, American General George Rogers Clark and 178 men captured the British forts on the Ohio River. This gave the United States control of the river and a claim to all the land north of the Ohio. In the Fall of 1779, Natives allied with the British attacked a company of men under Col. David Rogers and Captain Robert Benham near Cincinnati; only a handful of soldiers survived the attack. Benham later served as Packhorse Master under generals Harmar, St. Clair and Wayne during the wars of the 1790s. The Battle of Blue Licks was the last battle of the American Revolutionary War in Kentucky. On a hill next to the Licking River in what is now Robertson County, Kentucky, a force of about 50 British rangers and 300 Natives ambushed and routed 182 pursing Kentucky militiamen. With the end of the war, the Treaty of Paris (1783) with Great Britain gave the United States independence and control of the Northwest Territories, at least on paper. The Six Nations' allies were forced to cede most of their land in New York state to the United States, and many Six Nations families moved on to land reserves in old Quebec Province (now southern Ontario). The Ohio territory was subject to overlapping and conflicting claims by the states of Massachusetts, Connecticut, New York, and Virginia, and to those by the Shawnee, Mingo, Lenape and other actual inhabitants, who were no longer considered tributary to the Six Nations. While the British had suffered a major defeat at the Battle of Yorktown (1781), there had been no decisive defeat for their Native allies in the Northwest Territories. The Native tribes in the Old Northwest were not parties to the treaty. Many leaders, especially Little Turtle and Blue Jacket, refused to recognize United States claims to the area northwest of the Ohio River. The British remained in possession of their Great Lakes forts, through which they continued to supply Native American allies with trade items and weapons in exchange for furs. Some in the British government wished to maintain a neutral Native territory between Canada and the United States, but most agreed that immediate withdrawal was not possible without sparking a new war with Natives. The lingering British presence was not formally ended until their withdrawal from the Great Lakes forts pursuant to the Jay Treaty negotiated in 1794, and it would continue informally afterward until the War of 1812. Through the public sale of western lands, the Continental Congress sought to stabilize the dollar and pay down some of its war debt. The Land Ordinance of 1785 gave encouragement to land speculators, surveyors, and settlers who sought to gain new land from the Native Americans who may or may not have had a claim to it. To acquire most of the eastern portion of the Ohio Country, Congress negotiated the Treaty of Fort McIntosh in 1785 with several Native tribes. Settlers from Connecticut were already streaming into the Western Reserve, which extended into part of a reservation set aside for some of the tribes. The Northwest Ordinance of 1787, passed by the US Congress under the Articles of Confederation, gave Native Americans title, under U.S. law, to enjoy whatever lands they lived on. It also encouraged the influx of U.S. settlers north of the Ohio River. Localized ambushes and engagements between those settlers and Natives continued. The failure of the 1789 Treaty of Fort Harmar to address underlying grievances between the two sides exacerbated the problems. Co-operation among the Native nations forming the Western Confederacy had gone back to the French colonial era. It was renewed during the American Revolutionary War. The Confederacy first came together in the autumn of 1785 at Fort Detroit, proclaiming that the parties to the Confederacy would deal jointly with the United States, rather than individually. This determination was renewed in 1786 at the Wyandot (Huron) village of Upper Sandusky. The Confederacy declared the Ohio River as the boundary between their lands and those of American settlers. The Wyandot were the nominal "fathers," or senior guaranteeing nation of the Confederacy, but the Shawnee and Miami provided the greatest share of the fighting forces. In most cases, an entire "tribe" or "nation" was not involved in the war; the Native societies were generally not centralized. Villages and individual warriors and chiefs decided on participation in the war. Nearly 200 Cherokee warriors from two bands of the Upper Towns group known as Chickamauga lived and fought alongside the Shawnee from the time of the Revolution through the years of the Indian Confederacy. In addition, the Cherokee leader Dragging Canoe sent a contingent of warriors for a specific action. Some warriors of the Choctaw and Chickasaw tribes, which had been traditional enemies of the northwest tribes, served as scouts for the United States during these years. Still opposed to the US, some British agents in the region sold weapons and ammunition to the Natives and encouraged attacks on American settlers. War parties launched a series of isolated raids in the mid-1780s, resulting in escalating bloodshed and mistrust. In the fall of 1786, General Benjamin Logan led a force of Federal soldiers and mounted Kentucky militia against several Shawnee towns along the Mad River. These were protected primarily by noncombatants while the warriors were raiding forts in Kentucky. Logan burned the Native towns and food supplies, and killed or captured numerous Natives, including their chief Moluntha, who was murdered by one of Logan's men. Logan's raid and the execution of the chief angered the Shawnees, who retaliated by escalating their attacks on American settlers. Native raids on both sides of the Ohio River resulted in increasing casualties. During the mid- and late-1780s, American settlers south of the Ohio River in Kentucky and travelers on and north of the Ohio River suffered approximately 1,500 casualties. Settlers retaliated with attacks on Natives. In 1790, President George Washington and Secretary of War Henry Knox ordered General Josiah Harmar to launch the Harmar Campaign, a major western offensive into the Shawnee and Miami country. In October 1790, a force of 1,453 men under Brigadier General Josiah Harmar was assembled near present-day Fort Wayne, Indiana. Harmar committed only 400 of his men under Colonel John Hardin to attack a Native force of some 1,100 warriors, and Hardin was handily defeated in Hardin's Defeat. He lost at least 129 soldiers. Washington ordered Major General Arthur St. Clair, who served as governor of the Northwest Territory, to mount a more vigorous effort by summer 1791. After considerable trouble finding men and supplies, St. Clair was somewhat ready, but the troops had received little training. At dawn on November 4, 1791, St. Clair's force, accompanied by about 200 camp followers, was camped near where Fort Recovery, Ohio is now, with weak defenses set up on the perimeter. A Native American force of about 2,000 warriors, led by Little Turtle, Blue Jacket, and Tecumseh, struck quickly. Surprising the Americans, they soon overran the poorly prepared perimeter. The barely trained recruits panicked and were slaughtered in St. Clair's Defeat, along with many of their officers, who frantically tried to restore order and stop the rout. The American casualty rate was 69%, based on the deaths of 632 of the 920 soldiers and officers, with 264 wounded. Nearly all of the 200 unarmed camp followers were slaughtered, for a total of about 832 deaths—the highest United States losses in any of its battles with Natives. In 1792 Washington's emissaries Colonel John Hardin and Major Alexander Truman were murdered while on peace missions in Shelby County and Ottawa, Ohio. After St Clair's disaster, Washington ordered General "Mad" Anthony Wayne to form a well-trained force and put an end to the situation. Wayne took command of the new Legion of the United States late in 1793. After extensive training, his troops advanced into Native held territory and built Fort Recovery at the site of St. Clair's defeat. In June 1794, Little Turtle led an unsuccessful attack on Fort Recovery. Wayne's well-trained Legion advanced deeper into the territory of the Wabash Confederacy. Blue Jacket replaced Little Turtle in command, but the Native forces were defeated at the Battle of Fallen Timbers in August 1794. Blue Jacket's warriors fled from the battlefield to regroup at British-held Fort Miami. However, they found themselves locked out of the fort. Britain and the United States were by then reaching a close rapprochement to counter Jacobin France during the French Revolution. In 1795 the United States signed two treaties that recognized the changes in power. By the Treaty of Greenville, the northwest Native American tribes were forced to cede most of Ohio and a slice of Indiana; to recognize the U.S., rather than Britain, as the ruling power in the Old Northwest; and to surrender ten chiefs as hostages until all American prisoners were returned. Also that year, the United States negotiated the Jay Treaty with Great Britain, which required British withdrawal from the western forts while opening up some British territory in the Caribbean for American trade. The war has no widely accepted name; other names include the "Old Northwest Indian War", the "Ohio War", the "Ohio Indian War", and the "War for the Ohio River Boundary". In U.S. Army records, it is known as the "Miami Campaign". One historian has recently suggested naming it the "Miami Confederacy War", but other scholars have resisted naming the war after the Miamis (or Little Turtle, as was once common), arguing that this overlooks the centrality of Blue Jacket and the Ohio Country Natives in the war. Many books avoid the problem of what to call the war by describing it without putting a name to it, or ignoring it. Similarly, the battles and expeditions of the war do not have "standard" names in U.S. history books, except for the Battle of Fallen Timbers. Although this war was the first major military endeavor of the post-Revolutionary United States, and a major crisis of President George Washington's Administration, historians have sometimes overlooked it. Although 19th-century Indian Wars became more famous in American popular culture (in part because of being more recent), the Northwest Indian War resulted in more casualties of the United States military and noncombatants than the combined battles of Geronimo, Crazy Horse, Sitting Bull, Cochise, and Red Cloud. In the Battle of the Wabash (St. Clair's Defeat) Natives achieved their highest rate of casualties against the US Army. The Northwest Indian War was part of a long frontier struggle in the Ohio Country, which included the French and Indian War (1754–1763), Pontiac's Rebellion (1763–1764), Lord Dunmore's War (1774) and the American Revolutionary War (1775–1783). Many Native American communities perceived the wars as a kind of endemic warfare with European and American settlers that spanned several generations. For example, historian Francis Jennings suggested that the Northwest Indian War was, for the Lenape people, the end of a "Forty Years' War" that began soon after the Braddock Expedition in 1755. For some Natives, the conflict resumed a generation later with Tecumseh's War (1811) and the War of 1812 (hence their term Sixty Years' War). Conflict with the US continued to the 1830s era of Indian removals from east of the Mississippi. John Hardin, Colonel - killed on a peace mission at what would later become Hardin, Shelby County, Ohio. Alexander Truman, Major - killed on a peace mission at what later became Ottawa, Ohio. ↑ *Skaggs, David Curtis, ed (1977). The Old Northwest in the American Revolution. Madison, Wisconsin: The State Historical Society of Wisconsin. p. 318. ISBN 0-87020-164-6. Wikimedia Commons has media related to Northwest Indian War.